This unusually practical introduction to numerical control technology fully explains the most recent developments in machining and programming. Logically organized, it begins with a review of basic concepts and principles and moves on to tooling, workholding, machine setting, speeds and feeds, and part programming before concluding with a discussion of advanced techniques. Both beginning and advanced readers will find a wealth of information in this complete overview of computer numerical control. Presents a balanced introduction to both machining and part programming. 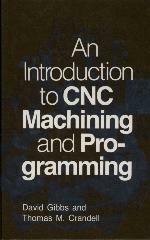 Uses the reader's knowledge on conventional machines to explain the operation of CNC machining. Includes sufficient information to provide the theoretical knowledge and practical aspects needed to comprehend CNC machining. Contains a chapter on conversational and manual programming as well as computer aided part programming. Offers hundreds of clear illustrations to fully clarify the text. Introduction to CNC. CNC Machine Design. Tooling for CNC. Work Holding and Part Loading for CNC Machinery. Terms and Definitions Associated with CNC Part Programming and Machine Control. Data Preparation and Input to Machine Control Units. Speeds and Feeds for CNC Machining. Part Programming: Techniques, Terms, and Definitions. Conversational and Manual Part Programming for CNC Machining. Computer-Aided CNC Part Programming. Advanced Techniques in CNC. Glossary. Part Programming Projects.